They’re ceramic. They’re adorable. You can never have enough measuring cups. And? They’re REASONABLY PRICED AND ON SALE! I know! Merry Christmas to ME! Next Next post: I try so hard to catch you, but you trick me all the time. Damn, they are cute, but would be broken instantly the way mine get banged around. They would be great for nuts or candies, though. 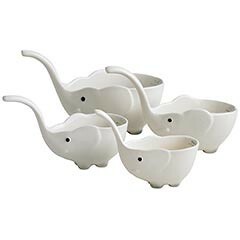 Or individual gravy boats. peggasus, ooh, individual gravy boats! i like the way you think. mmmm gravy in an elephant! love! I want the BIG one!! march that bad boy through my mashed taters! Do they come in pink, I wonder? All the elephants I ever see are pink!